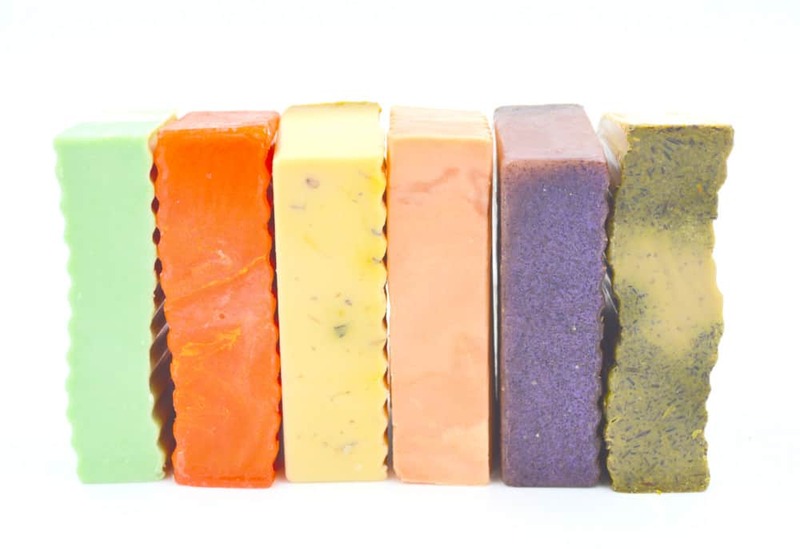 Our Super Soap Sampler includes our six most popular varieties of Handmade By Survivors soaps. Made with natural ingredients that soften and nourish your skin. Each bar is shrink-wrapped and weighs approximately 5 oz. Your purchase nurtures lives harmed by intimate partner abuse. Your purchase of Handmade by Survivors products will support victims of intimate partner violence as they establish safety, heal from the physical and emotional wounds of abuse. Making products has a special connection to our mission. The process provides collaborative work and microenterprise experience for survivors, while also generating resources for our organization. Our products are Kentucky Proud. Ingredients are listed in the additional information. Always test body products on a small area of skin for any allergic reactions before using. Avoid use of products that contain essential oil on sensitive regions of the body. Some essential oils are not safe for babies and pets. If you are pregnant or nursing, please consult your health care professional before using. Glycerin soap that blends lemongrass and lavender for a clean and rejuvenating aroma. Made with natural ingredients that soften and nourish your skin: coconut oil, palm oil, safflower oil, dried lavender flowers, and lavender, lemongrass, and clary sage essential oils. 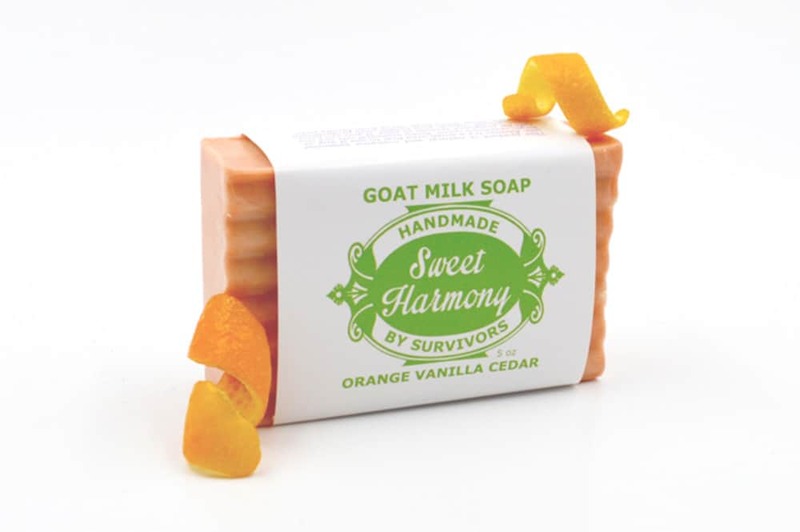 Goats milk soap featuring orange and vanilla with hints of warm cedar. Handmade By Survivors using natural ingredients that soften and nourish your skin: coconut oil, palm oil, safflower oil, goats milk, dried vanilla bean, sweet orange essential oil, cedar wood essential oil, and vanilla essential oil. 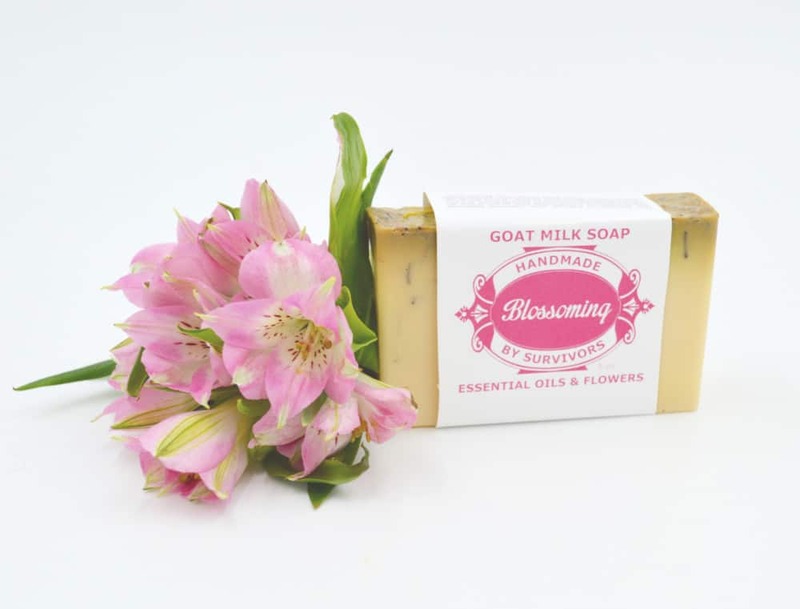 Herbal goats milk soap that blends essential oils and dried flowers grown on our Kentucky farm for fragrant clean. Handmade By Survivors using natural ingredients that soften and nourish your skin: coconut oil, palm oil, goats milk, and essential oils of rose, geranium, lavender, clary sage, sweet orange, patchouli, and basil with dried flowers including calendula, lavender, and bachelor buttons. 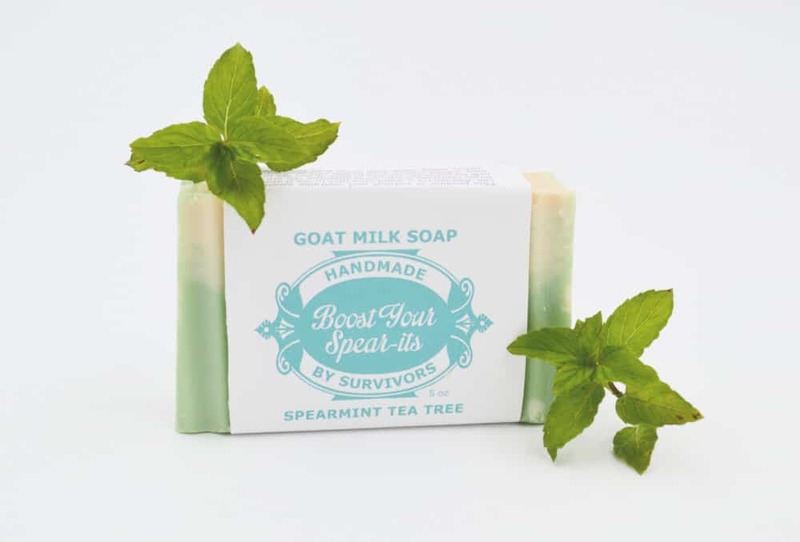 Goats milk soap blends spearmint and tea tree oil for a rejuvenating scent. Handmade By Survivors . Made with natural ingredients that soften and nourish your skin: coconut oil, palm oil, safflower oil, goats milk, essential oil of spearmint, vanilla, and tea tree. Glycerin soap that combines energizing peppermint, soothing eucalyptus, and a touch of shimmer perfect for the holidays. 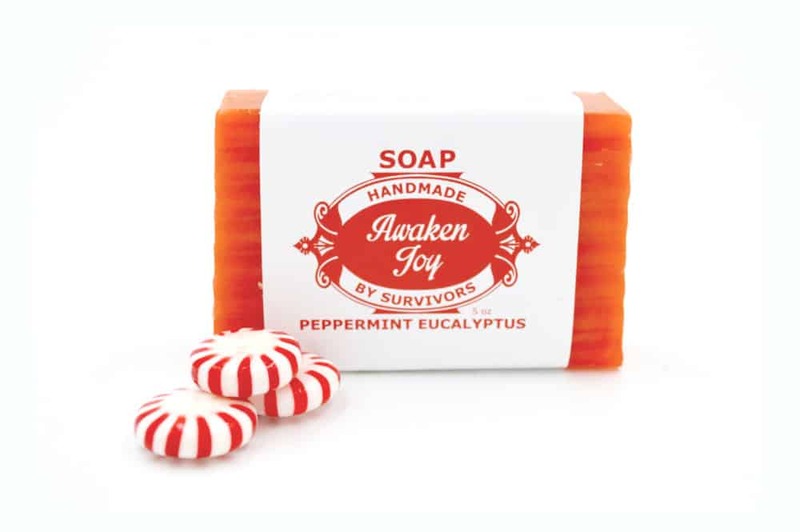 Handmade By Survivors using natural ingredients that soften and nourish your skin: coconut oil, palm oil, and essential oils of peppermint, rosemary, sweet orange and eucalyptus. 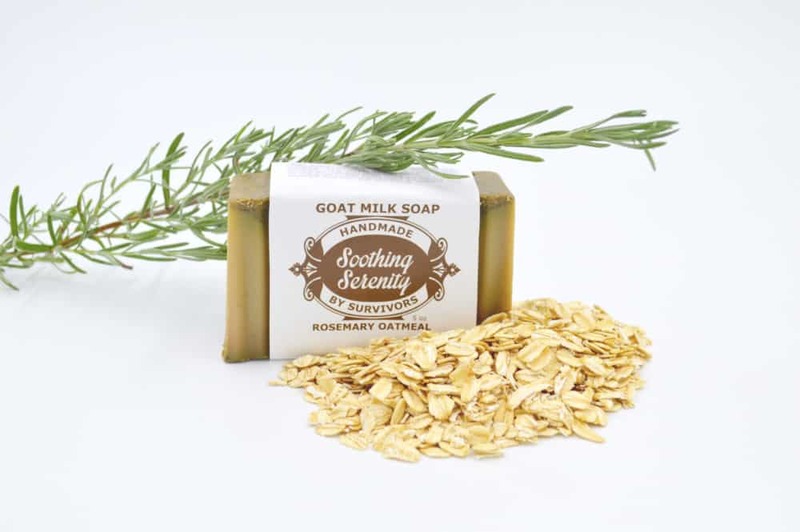 Herbal goats milk soap features oatmeal and rosemary combine for a calming herbal cleanse. 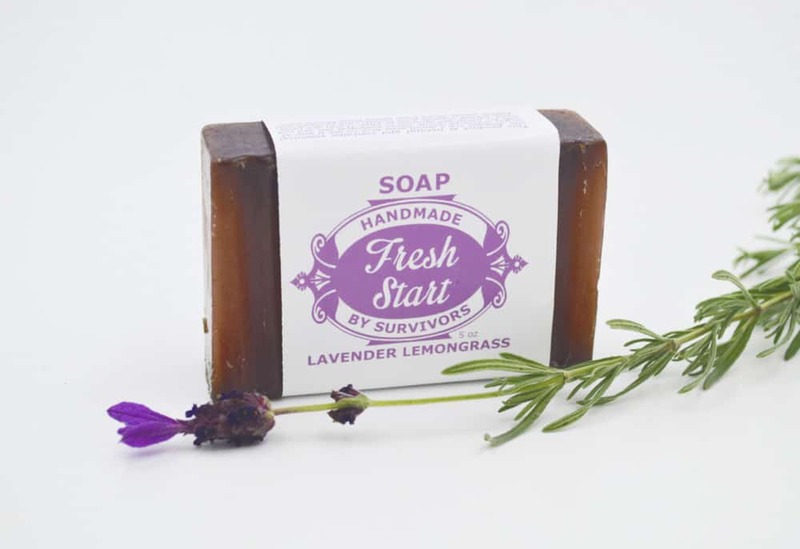 Handmade By Survivors using natural ingredients that soften and nourish your skin: coconut oil, palm oil, safflower oil, goats milk, dried rosemary herb, rosemary essential oil, sweet orange essential oil, lavender essential oil, cedar wood essential oil, and clary sage essential oil. What is your holiday order deadline? Orders reserved for local pickup may be placed through 11:59 EST on Thursday, December 20 for pickup on December 24. Most shipped orders must be placed by 11:59 PM EST on Wednesday, December 19 to meet the USPS Priority Mail deadline for delivery by December 24; however, if your order includes an aroma spray, it must be received by 11:59 EST on Friday, December 14 to meet USPS deadline for ground delivery by December 24. Can I pick up my order if I live in Lexington or the surrounding area? Yes! You can pick up your order from our farm between the hours of 10 am and 5 pm. Just enter coupon code LOCAL17 during check out to let us know and remove the shipping charges. We will email you driving directions to our property when your order is ready for pick up. Please note that our facility is about a 20-30 minute drive from downtown Lexington. What if my order is a gift for someone? We are happy to include a complimentary gift card with your order! Include the message for the gift recipient in the notes section during checkout. What if my shipping costs seem high? Unless otherwise noted, we ship our products by USPS Priority Mail. Estimated shipping costs are based on size and weight per item. We will make every effort to ship your order as affordably as possible. If our estimated shipping for your order exceeds actual shipping costs by more than $2, we will issue a refund for the excess amount to the credit card used to purchase the order. 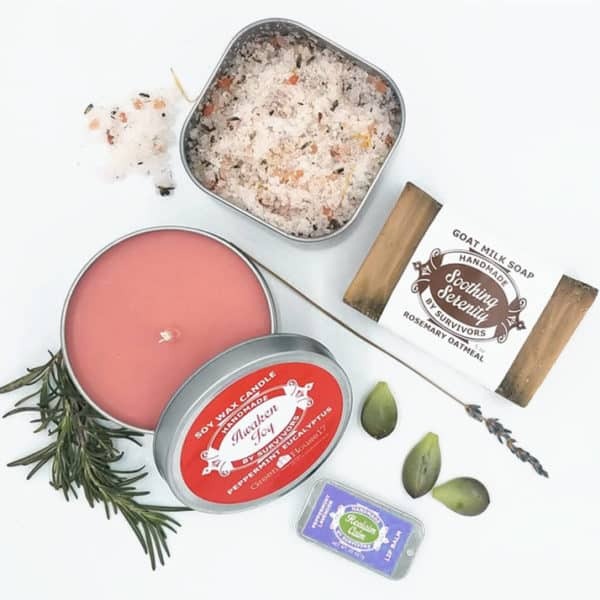 A curated box of Handmade By Survivors products makes the perfect gift! Natural and nourishing, every item included in our Hope Box features essential oils and dried flowers from our farm. And an original design by Kentucky artist Jessica Holly will be hand-printed on each box. Ships free of charge. If you’d like us to include a handwritten message for a gift recipient, please include a note with your order. A collection of our Sweet Harmony products featuring our best-selling blend of essential oils. Sweet orange and vanilla combine for a happy scent many people say reminds them of a creamsicle. Includes coordinating soap, candle, bath salts, and aroma spray. Handmade by Survivors with ingredients that nourish body and spirit. Your purchase nurtures lives harmed by intimate partner abuse. 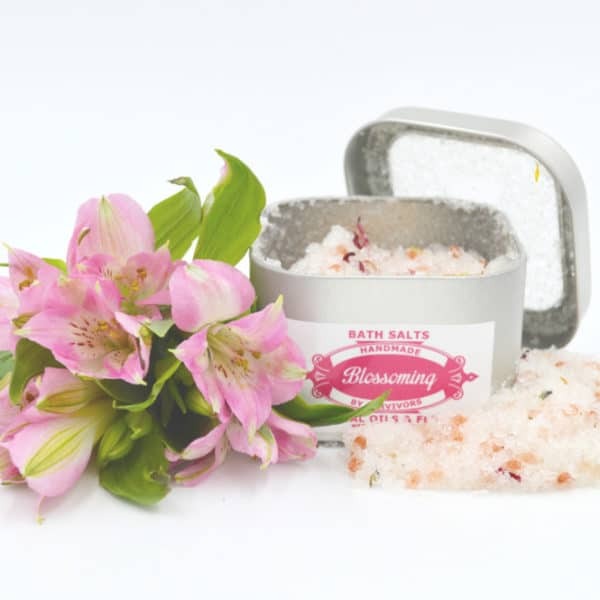 Take time to unwind with our Handmade By Survivors bath salts featuring Himalayan pink mineral and epsom salts to relax and soothe. 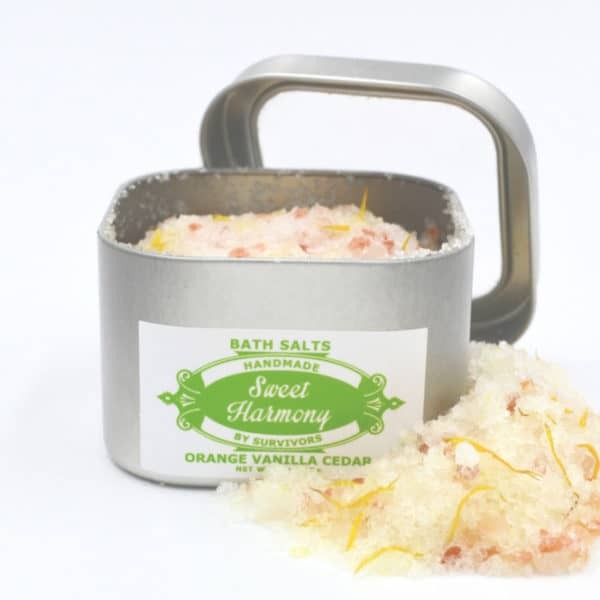 Sweet Harmony blends essential oils of sweet orange and cedarwood with dried calendula from our farm. Each tin includes 8 oz of bath salts. Add a little or a lot of salt to warm water as your tub fills. Your purchase nurtures lives harmed by intimate partner abuse. Take time to unwind with our Handmade By Survivors bath salts featuring Himalayan pink mineral and epsom salts to relax and soothe. Blossoming blends essential oils of rose geranium and lavender with a bouquet of dried flowers from our farm. Each tin includes 8 oz of bath salts. Add a little or a lot of salt to warm water as your tub fills. Your purchase supports survivors of intimate partner abuse.